I use an all-terrain rolling walker (also known as a Walk'n'Chair) to get around. I simply can't leap tall buildings in a single bound anymore, or even climb over modest size rocks and tree limbs. The whole idea for this web site was to catalogue outdoor locations in Northern California where I can get outdoors, enjoy the scenery, see some wildlife, admire the seasons, and take a few fine photographs to remember to trip. Here's what I use: The All Terrain Walk'n'Chair is the 'real deal'. While you won't be scaling cliffs with it, you will be able to walk down most trails, up gravel roadways, follow skid trails, negotiate lumpy fields, and master most terrain. 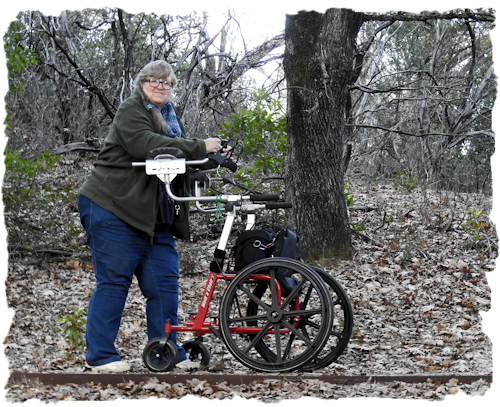 It changes the world for people who need a true all-terrain mobility walker. You don't have to be left behind. My hobby is nature and wildlife photography. I'm strictly an amateur. I'll always be a hobbyist as it's way too much work to be anything else. Taking photos motivates me to go somewhere scenic. When I first started tracking down wheelchair and rollator accessible adventure opportunities, I thought there wasn't much. I was incorrect. However, the locational information is hard to find. I created this web site for Northern California so that a person who uses a rolling walker, wheelchair or simply walks slowly won't have to spend hours trying to find somewhere awesome to go beyond a scenic drive. It's not a comprehensive list, but it's a start. Here's the thing: The information I've accumulated by rummaging around the www is just that - information about possibilities, not certainties for wheelchair and rolling walker access. I'm having fun checking out scenic drives, accessible trails, campgrounds, waterfalls and wildlife refuges. I hope you will, too. Because I will not have personally visited or reviewed every link I list, link inclusion is not a guarantee that when you arrive that the attraction will be 'accessible' at your level of abilities. Links I mention are more of a listing of possibilities, of places to check out. Some will be winners and others won't. Have a back-up plan and another place to visit if the first doesn't work out. Keep in mind that wheelchair accessibility (aka barrier-free) rules for national forests, parks, monuments, and federal recreation areas are noticeably different than ADA rules governing states, counties or for-profit attractions open to the public. Plus, most of the people who describe a location as 'accessible' in literature and on web sites don't actually use a rolling walker or wheelchair. Consequently, you will sometimes wonder just who they were thinking of when posting that 'X' location is 'accessible' or that a trail is 'flat' when you are clearly pushing uphill. Doing anything outdoors involves risks, and if you have a mobility challenge (like me) or some other disability, then survival in the woods or a description that says 'easy hike' takes on a whole different shade of meaning. Being well prepared before attempting any outdoor activity is something I take very seriously. You should, too. So, let's get down to the activity of exploring Accessible Adventures in Northern California!